Who doesn’t love a white Christmas? While it’s chilly here, the snow flakes aren’t yet falling and its looking like this Christmas won’t be a white one! We’re hoping that this next beauty will be our sort of snow dance & bring on the snow! The pearl in this white is just like the glitter in snow flakes – it is gorgeousssss! The NXT rolling chassis just assembled and rolling. Body sealed in the booth and drying. Next the snow white under coat was laid down. How about this awesome white pearl! Pearl sprayed down with several coats of clear, this is a sharp white! With the body dry our team wasted no time assembling the rear end! Next came the rear seat frame work. Folding rear seat kit, you can carry passengers or stuff! Plus our customer is getting one of our NXT angled bad holders, this is truly the multi-purpose neighborhood cruiser! Our SC Drive system offers unmatched performance. Check out how this cart is coming together. 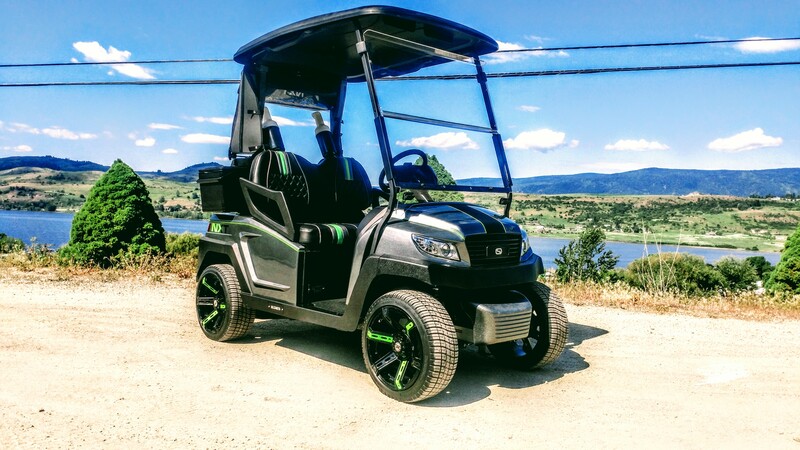 Our custom front grill and accent stripes step this cart up to the next level! Full information display, you know what is going on with your NXT at all times! The stretched roof is installed and we only have a couple more touches to button this cart up. With only a couple, but very important, touches left this cart is going to be turning heads at Predator Ridge Resort!